Looking for a new way to use canned pumpkin? Try making pumpkin cookies. Autumn Pumpkin Cookies are so delicious. They’re moist, flavorful and easy to make. 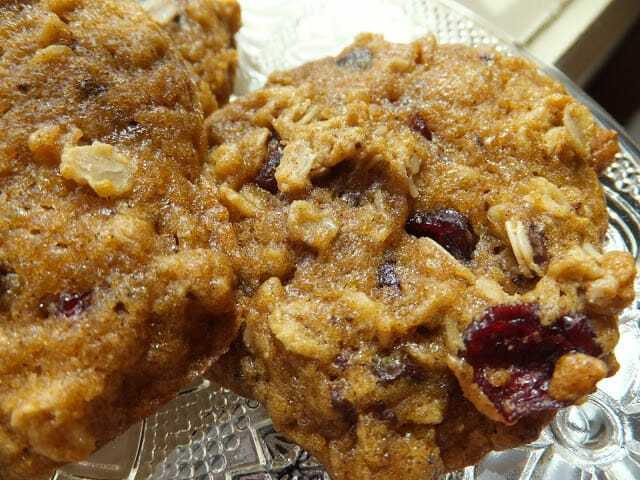 They’re also loaded with canned pumpkin, oatmeal, dried cherries or cranberries and mini chocolate chips. 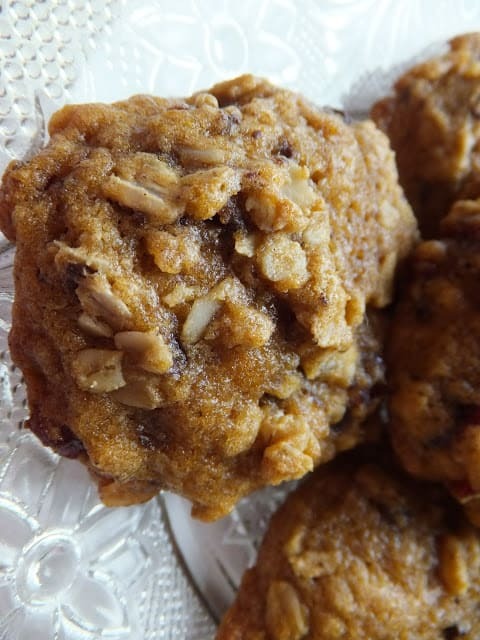 Autumn pumpkin cookies are packed with all of the warm spices that are associated with autumn such as: ginger, nutmeg, cloves and pumpkin pie spice. These cookies are beyond delicious! If you have never made pumpkin cookies before, you need to give this recipe a try. Feel free to experiment with this recipe. Try adding white chocolate chips or cinnamon chips instead of the mini chocolate chips for a deliciously new and tasty twist. Heat oven to 350º Line baking sheets with parchment paper, set aside. Whisk flour, oats, baking powder, cinnamon, ginger, salt, nutmeg, pumpkin pie spice and cloves in a medium bowl, set aside. Place the butter and sugars in a large bowl. With electric mixer, beat on medium speed until lightened in color and fluffy, about 5 minutes. Stop the mixer and scrap down sides of bowl often. Add the egg and vanilla, beat on medium speed, about 30 seconds. On low speed, add half of the flour mixture to butter mixture and mix just until blended. Add half of the pumpkin and mix just until blended. Repeat with the flour mixture and pumpkin. 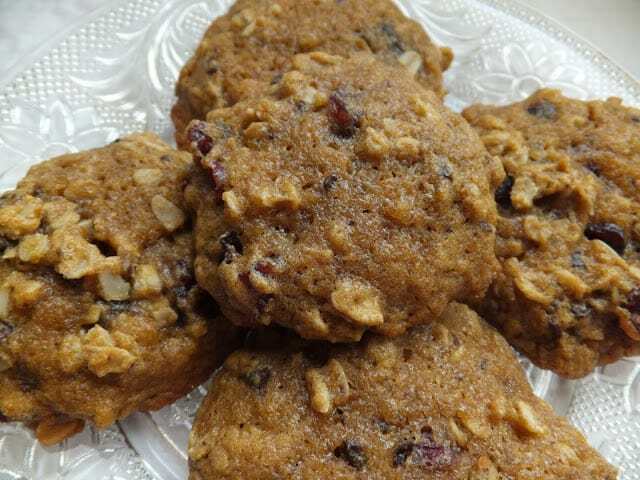 Gently stir in the dried cherries and chocolate chips. Drop by rounded tablespoons onto parchment lined baking sheets. Bake at 350º for 12 to 15 minutes. Keep batter in the refrigerator between baking batches. Cool cookies on wire rack. Store in air tight container. Overnight Pumpkin Pie Oatmeal will bring the smells of Autumn into your kitchen. *For this recipe we used Libby’s Canned Pumpkin. 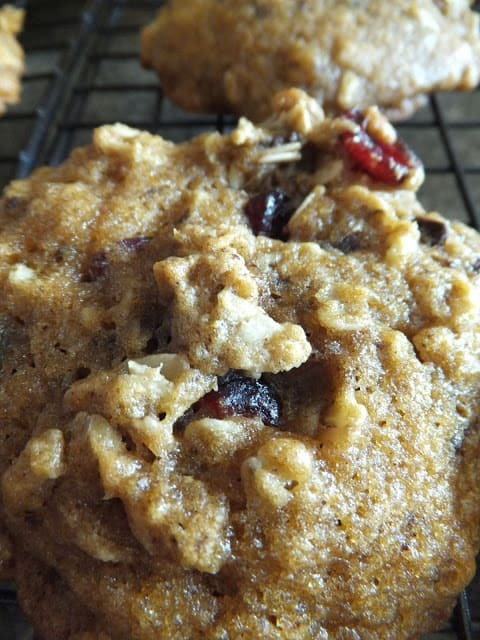 Hi Lynn, I haven't taste pumpkin cookies but yours look addictive and looking at the ingredients it sure look flavorful. I love anything with cinnamon and nutmeg. Yum, these look delicious! I love the edition of cranberries.